Back to research! 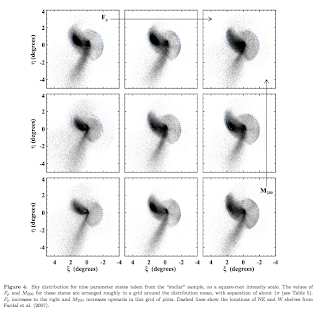 And this week, it's a new paper from Mark Fardal. Mark is an expert in modelling galaxy collisions, and we've been looking at the big collision going on next door, the Giant Stellar Stream in Andromeda. One of the tough things to do is measure the mass of an object. Measuring the mass of stars is possible as long as it is orbiting another star, or has a planet orbiting it. Basically, the laws of gravity and motion given to us by Isaac Newton means that we can unravel the masses involved. However, measuring the mass of galaxies is much harder. Firstly, unlike stars, which can effectively be treated as point mass, the mass in galaxies is more complex. It is at its highest densities in the middle, but is roughly continuous, falling off as we head outwards. In this situation, using the laws of gravity and motion are messier to use. There is another, bigger problem. That is that the majority of the mass in a galaxy is dark matter, which, while we can't see it, the motions of stars within a galaxy will be driven by dark matters gravitational pull. 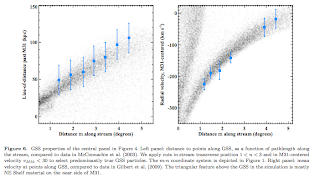 I've written before that it is very difficult to measure the distribution of dark matter out of the visible plane of stars seen in galaxies like the Milky Way as there are very few "tracers" (i.e. stars) out there whose motions we could use to measure mass. This is where this new paper comes in. 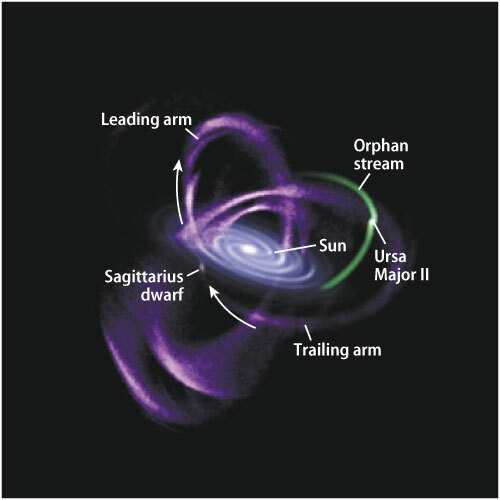 In the Milky Way, we have the Sagittarius Stream which orbits over the pole, and we can use it to measure the dark matter distribution. In Andromeda, we have the Giant Stellar Stream. We have the same thing with the Giant Stellar Stream in Andromeda, although the orientation of Andromeda and the stream means that it can be a little harder to see. 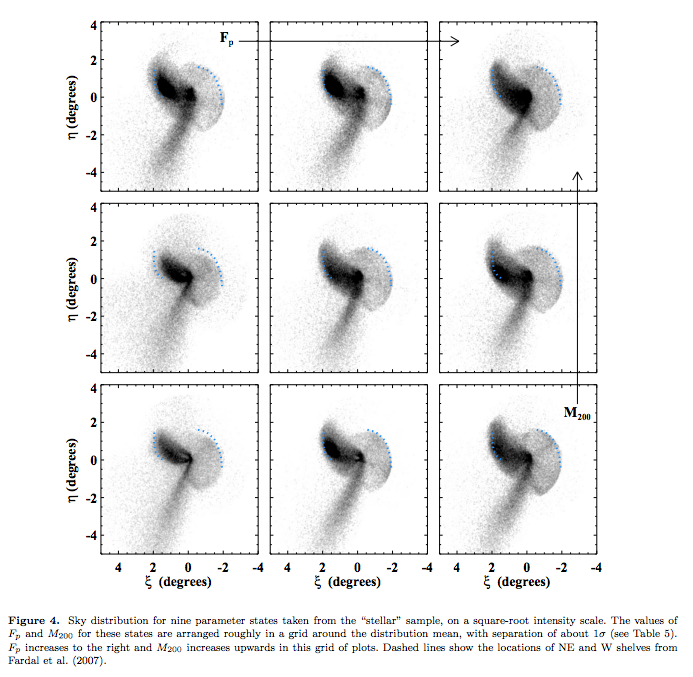 Here's a picture from the paper, showing data that we obtained more than a decade ago with the Isaac Newton Telescope. As you know from my posts on the PAndAS program, the lovely image of Andromeda that we are used to is buried down in the middle of the mess of stellar debris. In the left-hand image, you can see the Giant Stellar Stream sticking out from the bottom, but there are other features apparent. These are called "shelfs" and are basically loops like we can in the Sagittarius image above, but viewed roughly edge-on. So, if you try and think in 3D, you can see that the stream wraps around the centre of Andromeda. So, how do we use this to measure the mass of Andromeda? Basically, you throw dwarf galaxies into Andromeda galaxies and see which reproduces the features we see above. In the right-hand panel are the patches of data that we want to compare to. As you can see, we can reproduce the generic features of the structure we see on the sky, but there is more. We don't only have the view on the sky, but (through lots of other observations) we know the distance to points on the stream, and how fast it's moving. So, we need to ensure that our modelled dwarfs also reproduce these observations, which they do! which is exactly where we'd expect it to be. Now, that might not sound impressive, but the mass of the Milky Way and Andromeda see-saws back and forth, up and down, and there is, what scientists like to refer to as "tension" (although when I hear the word, I can't help thinking of this man singing this song) between observations and expectations. Luckily, our result plonks things where you'd expect them to be). The progenitor, which badly shaken up, is still there, nestled into the outer disk region of Andromeda. Enjoy it, it isn't going to last much longer. Well done Mark! M31 has a giant stream of stars extending far to the south and a great deal of other tidal debris in its halo, much of which is thought to be directly associated with the southern stream. 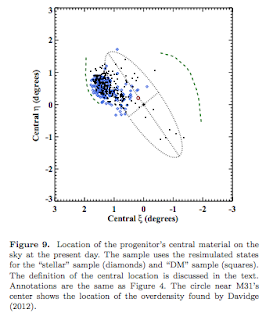 We model this structure by means of Bayesian sampling of parameter space, where each sample uses an N-body simulation of a satellite disrupting in M31's potential. 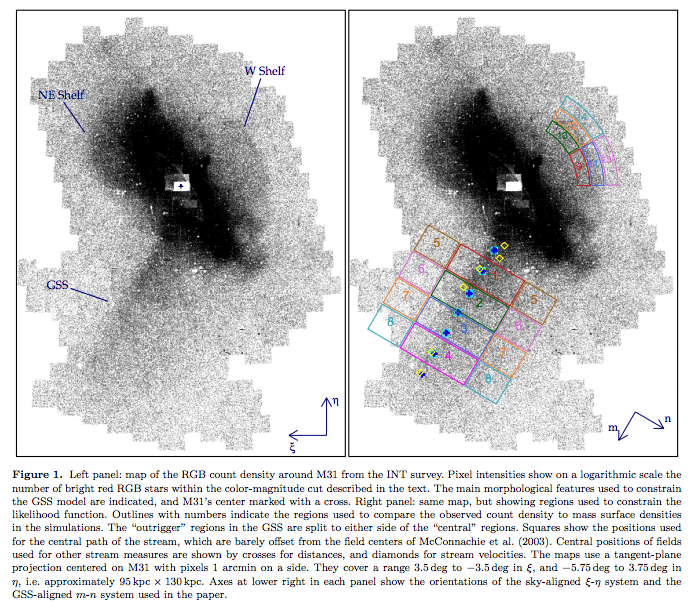 We combine constraints on stellar surface densities from the Isaac Newton Telescope survey of M31 with kinematic data and photometric distances. 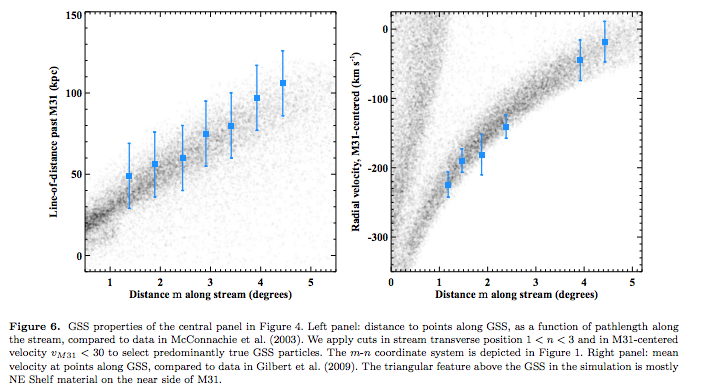 This combination of data tightly constrains the model, indicating a stellar mass at last pericentric passage of log(M_s / Msun) = 9.5+-0.1, comparable to the LMC. Any existing remnant of the satellite is expected to lie in the NE Shelf region beside M31's disk, at velocities more negative than M31's disk in this region. 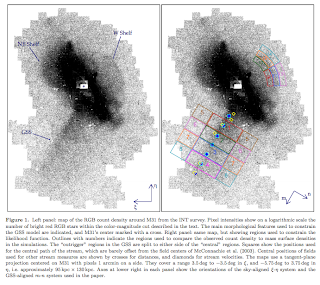 This rules out the prominent satellites M32 or NGC 205 as the progenitor, but an overdensity recently discovered in M31's NE disk sits at the edge of the progenitor locations found in the model. M31's virial mass is constrained in this model to be log(M200) = 12.3+-0.1, alleviating the previous tension between observational virial mass estimates and expectations from the general galactic population and the timing argument. The techniques used in this paper, which should be more generally applicable, are a powerful method of extracting physical inferences from observational data on tidal debris structures.